I love pop art. 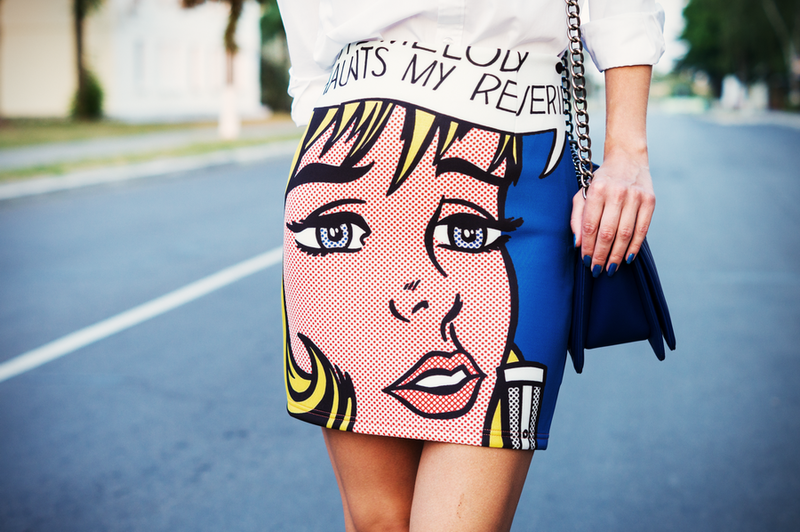 This skirt is amazing ! I invite you to visit my blog, and would be more than happy if we follow each other!! Oh my gosh I love the fun character skirt and the chunky necklace. Love your outfit! Thank you for your comment on my blog. I'm following you now on G+ and GFC. Please follow back. Ты такая красотка, не устану это повторять!!! Каждый твой образ я бы отправляла в глянцевые журналы!!! И да, нежные пастельные цвета тебе очень идут!!!! Lovely skirt !! so cool !!!!!!!!!!!!!!! Wow! You have a really fantastic blog. Cool text and photos. I see that you put a lot of work in this blog. Keep it up! That skirt is so cool! I'm sure I couldn't pull it off, you look great! love your skirt so much! so playful. It should catch everyone´s attention when you walk around. And the necklace is just perfect with it, matches the style perfectly.